On my journey (back in August) to find the best cupcake in DC, we went to hello cupcake in Dupont Circle. We (aka Pepe, Kar, Baby O and me) shared these between the 4 of us (ok, I'll be honest, Baby O just had a small bite of one and I ate the majority). Kar and I have become connoisseurs of sorts (ok, to be honest, we're not the educated in cupcakeries and we're not that fancy, but isn't connoisseur a fun word to use? ), we take a small bite and really taste it. Then move on to the next cupcake. 5. triple coconut - 3rd best - i love coconut and there is a lot. 6. raspberry beret - blah...last place, although the chocolate cake is good. Still, my top favorite is a tie between vanilla 2 at Georgetown Cupcake and a mix of the cream cheese frosting at Red Velvet Cupcakery and red velvet cupcake at Georgetown Cupcake. 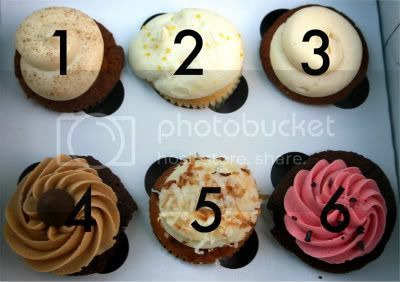 Do you have a favorite cupcake place? yum...sprinkles...you guys also have dots too. I've been to Hellow Cupacake..It's really yum! !